A look at 129 First Ave. W., the former Espolon restaurant, on Nov. 19. This building on First Avenue in downtown Albany has been closed since part of its façade collapsed during attempted repairs more than a year ago. But now the owner has submitted repair plans for the city’s review. 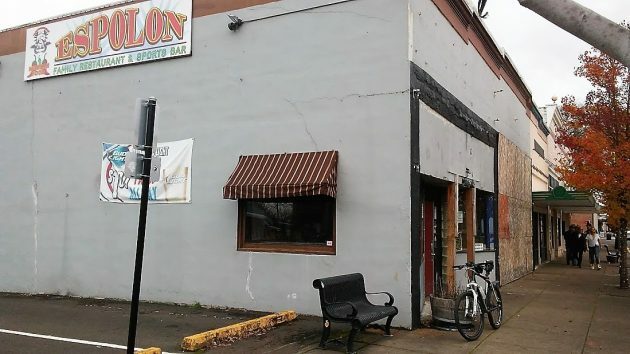 Before the shutdown, the building at 129 First Ave. W. housed a restaurant and bar called “Espolon,” which is Spanish for spur, especially the spurs on the back of a rooster’s legs. A banner advertising tacos for one dollar each still hangs on the outside western wall. The owner is Gary C. Nieland, of Las Vegas. He submitted plans to rebuild the storefront and modify the window on the west side, and because the building is considered historic, the application will undergo historic review. The Albany Community Development Department asked the applicant for clarifications on a couple of points, and when that’s done the plans likely will go to the city’s Landmarks Advisory Commission for a hearing in January. Albany considers the structure historic. According to county tax records, it was built in 1920. Apparently there had been a lot of deterioration, because when repairs were attempted to get rid of dry rot, part of the front wall collapsed. The city issued a stop-work order on Sept. 22, 2016. The front was boarded up and braced, and that’s where things have stood since. The CARA Empire rotting from within. Happy to hear that the history of this building will be preserved, improved and added upon! If they rebuild and make a walk-up window out of that window they are planning to modify, they could make a killing selling dollar tacos to drunk people downtown. When the dry rot finally gave way and a portion of the Epsolon’s front wall collapsed, were the fragments of rotted wood and rusting nails preserved for the planned Memorial to be constructed to anchor downtown at the other end of First Street. With the newly-minted Carousel at one end of First Street and the proposed Espolon Memorial at the other, Albany’s premiere boulevard will have strong tourist-wrangling anchors at both ends. In time, the City should see a healthy rash of investment within the urban boundary. Hopefully, Federal, State, County and City archeologists were able to “bag and tag” the fallen Espolon detritus. The more original parts there are to the “green” memorial the more likely it is to generate cash flow, especially from hordes of hiking, hungry history buffs, all of whom value the past and all of whom will require services in the downtown. The restrictions for historic buildings being demolished or rebuilt in historic fashion, will delay real downtown economic success. The same goes for housing in The Monteith District. Some houses are so old, that pouring dollars into them is fruitless. If you want a continued vibrant downtown and nearby neighborhood, drop the historic designation of constant upkeep of delapidated business buildings and homes. Unless you want Albany’s downtown housing to invite a future poverty that might sink any real economic success for new business downtown; reverse course on historic, outdated regulations that stifle the future of Albany’s oldest area. So on point. Not every old house in Albany is worth saving. The architecture is worth saving. Tearing down old decrepit homes and replacing them with new homes with exterior design that fits neighborhood makes more sense. It is really hard to believe that the building formerly housing Espolon is historic. There is nothing notable about its construction, nor its history. 1920? Oregon is still a young state and while there are some interesting and historic homes here, most of the commercial buildings down on 1st and 2nd street would fall down if they were not leaning on each other. The owner and the City would both benefit from tearing that building down and putting up a new building maybe with period architecture like the bank building on Lyon St. The East Coast has buildings that go back hundred of years not like this one that is not even 100 years old.